Additional Info: Distinguishing features include granuloma (seen in this image) acute and chronic transmural inflammation, crypt distortion, and metaplasia. Involvement can be scattered (ie. skip lesions). Screening biopsies are performed to screen for dysplasia. 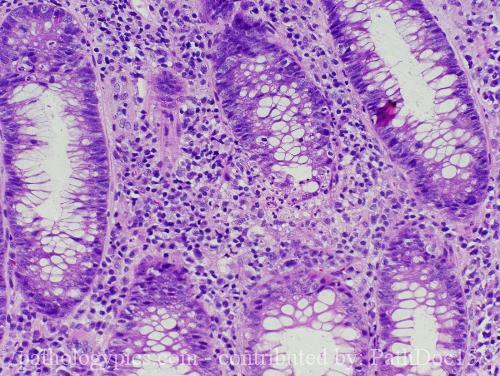 Individuals with Chrons disease are at a 3-5 fold increased risk of developing colon carcinoma.